Happy New Year! Another year is upon us and it’s time for choosing a realistic weight loss goal that you can achieve. Unfortunately many of us do not plan goals properly and this ultimately comes to the conclusion of many people not succeeding. 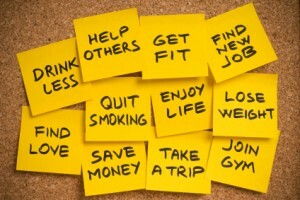 It’s important that you plan your weight loss goals so that they set you up for success. Losing weight is a gradual process and many people set goals that are unachievable. Let’s say for example you weigh 190 lb.. and you want to lose 50 lb.. If you set your goal to be achieved in 30 days then you’re going to be in for a surprise. The results you’re looking for are going to be extremely hard to achieve. Especially if your diet consists of ice cream, fast food, and unhealthy snacking. It’s not enough to just say you want to lose 50 lb. That is an over simplification of losing weight that will set you up to fail. You have to have a strategy in place that is going to take you from start to finish to lose those 50 pounds. You need to know what foods you’ll be eating every day and have healthier snack alternatives than you’re normally used too. With my clients I see that it’s hard to break habits with snacking and unhealthy eating because my clients are so addicted to eating sugary snacks. 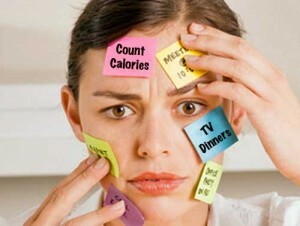 If this is you then try to lean yourself off of the junk foods. Of course you will still need to eat junk food however, the object is to slowly transition to healthier snacks and foods. In the long term you can completely get rid of the sugary snacks and this will set yourself up for success. The Solution: It’s perfectly fine that you want to lose for example 50 pounds However, you have to break it down into small chunks so you can process your results better. In the long run losing 50 pounds is great although you have to lose weight chunk by chunk. Have your long term goal set to your desired weight loss amount and then try to lose the first 5 pounds. Then move to the next 5 pounds to lose and then you’ve lost a total of 10 pounds. Do you see how this strategy is much more sustainable than just shooting for a random number? Pick goals that don’t shoot past the stars. Saying you want to lose 50 pounds in 1 month may be too much weight for you to lose at once. It’s recommended that you shoot to lose 2-4 pounds per week. Wondering what foods you MUST start avoiding to lose weight this year? <== Click the link to see! Is Your New Year’s Resolution Setup To FAIL?